The Mandarin orange, also known as the mandarin or mandarine (both lower-case), is a small citrus tree (Citrus reticulata) with fruit that looks like other oranges. Mandarin oranges are usually eaten plain or in fruit salads. 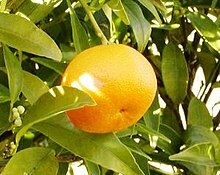 The mandarin is tender, and is damaged easily by cold. It can be grown in tropical and subtropical areas. The mandarin is easily peeled with the fingers, and can be easily split into even segments without squirting juice. This makes it more convenient to eat, as utensils are not required to peel or cut the fruit. Mandarin segments are also sold in cans. During Chinese New Year, Mandarin oranges and tangerines are considered traditional symbols of good fortune. During the two-week celebration, they are frequently displayed as decoration and presented as gifts to friends, relatives, and business partners. Wikimedia Commons has media related to Citrus reticulata. Wikispecies has information on: Citrus reticulata. This page was last changed on 23 April 2018, at 18:31.